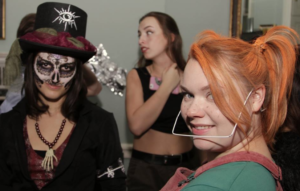 NCH Halloween blog post by Rowan Sykes. 2018. Hosting the Halloween party was huge for the LGBTQ+ Society. There’s nothing better for diversity and inclusivity than an event involving the whole college whilst celebrating all the best parts of London’s queer culture scene- the dancing, the theatrics, the ability to get on the tube wearing as much glitter as you want! 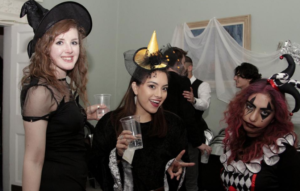 No costume theme meant that people could go as wild as they wanted, and did they ever: sugar skulls and space cowboys, drag queens and Spice Girls, vampires and angels, even a witch whose scooter-broomstick was made up about 90% of glow sticks. At the end of a hectic first term, people wanted to party, and as the recently named president of the LGBTQ+ Society, I had big boots to fill and was going to make sure this was the best party yet. The first hit of the evening was the punch: red fruit and white spirits, filled with sweet lychee-eyeballs and topped with fabulously theatrical dry ice! 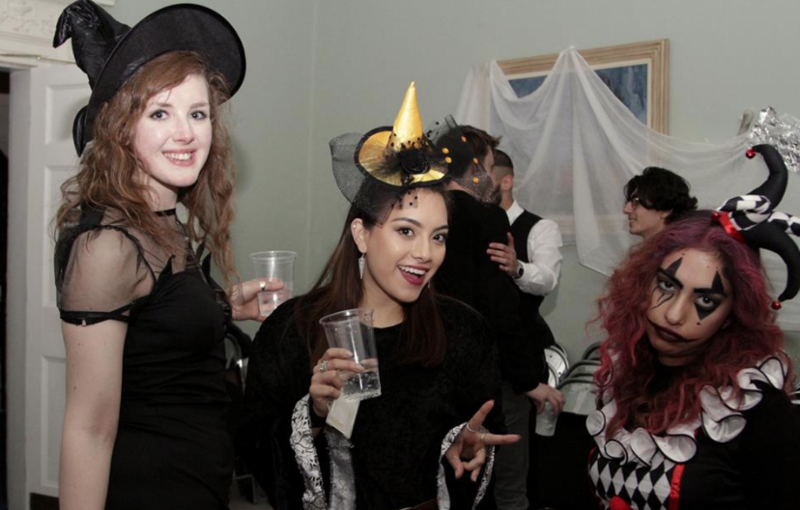 College bar prices always make the drinks a favourite, but Halloween’s mixology showmanship had everyone dazzled. A few Sambucas into the evening and the song that got everyone up and dancing was Jump Around by House of Pain- nothing like a kick of dancefloor nostalgia to get the last of the 90s kids moving! Everyone was in unison for Macarena; everyone had their solo in Bohemian Rhapsody. Nobody failed to “da da da da” to Chelsea Dagger or I’m Gonna Be, and we all joined in on every “too-ra-loo-rye-aye” of Come on Eileen. Every few songs, Bedfellows would appear and lead some (totally willing) victims down to the basement Haunted House. Insanity, evil twins and axe murder ensued between the dingy cobweb-strung walls of the basement as the actors, I quote from a student, “didn’t break character once”- if you didn’t find the screams of tortured souls quite terrifying enough just wait until you find one of them clinging to your ankle and begging for rescue! A huge thanks is in order to all of Bedfellows- on top of the myriad compliments from students frightened and fascinated alike- for turning the fear factor up to 11! With the basement closed for the evening and everyone thoroughly haunted, it was time for the evening’s main pageantry: the Lip Sync Battle. My fiancé and I opened with the fittingly fabulous Scissor Sisters’ I Don’t Feel Like Dancin’, which got everybody feeling like dancing, before a series of increasingly more nostalgic performances: a dazzling duet to Jason Derulo’s Tiptoe, Wannabe performed with costumes good enough to be a bona fide Spice Girls reunion, an entire group re- enactment of Wheatus’s iconic Teenage Dirtbag video, and an unforgettable solo performance of Pink Floyd’s The Great Gig in the Sky which entirely transcended both gender and lyrics, completed with the special performance- a flawlessly rehearsed and synchronised performance of Moulin Rouge’s Lady Marmalade. The contest’s worthy winners were of course vampire flapper Teoni and sultry psychiatrist Lucy, whose risqué dance moves and admirably accurate lyrics to Black Eyed Peas’ My Humps totally stole the show. As it is with Halloween, the prize for Best Costume (or lack thereof) had to go to the most daring: Rocky (of Horror Picture Show fame) wearing gold hot pants, a painted six-pack, and not much else! Understandably, the hugely appreciated £25 bar tab prizes did not last long! Overall, it was a hit! It seemed like the dancing just couldn’t go on for long enough, the entertainment didn’t miss a beat with special thanks to Brian, Bedfellows, and our beloved bartenders, and the opinion was unanimous: we cannot wait for next year! Rowan Sykes is a current student at New College of the Humanities. Read his blog entries here.